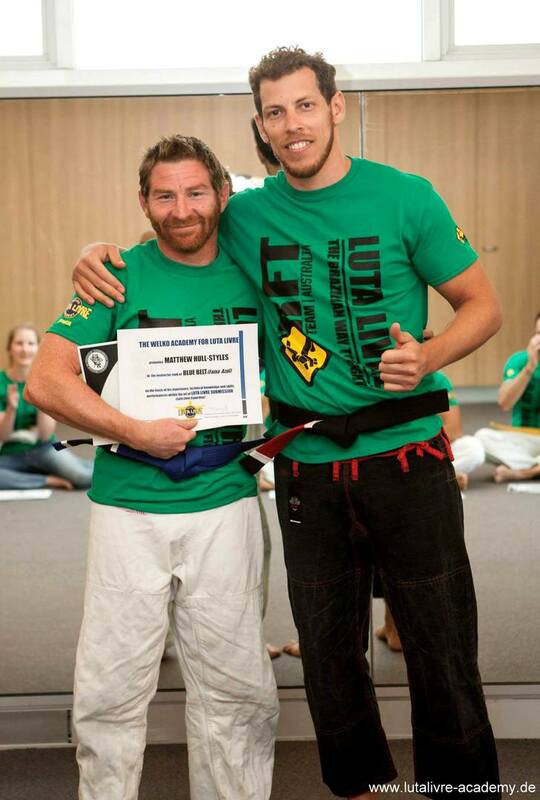 First Luta Livre graduation ceremony in Australia. On the 30th April 2015 the first Luta Livre graduation ceremony ever conducted on Australian soil took place in the Sunshine Coast, Queensland. The ceremony was led by RFT Luta Livre Black Belt and Welko Academy project leader Nico Welko. According to the pedagogic approaches of the Welko Academy, 4 white belts levels (Nadine Schröder 1st grade, Amanda Fowler 2nd grade, Jordan Lines 3th grade and Jared Melanson 4th grade), 3 Yellow Belts (Callum Lewis, Mathew Manwaring and Ammon Cooper), 1 Orange Belt (Jay Odell) and 1 Instructor Blue Belt (Matthew Hull-Styles) were awarded. The color Belts were also certificated by the Federação International de Luta Livre e Submission of Rio de Janeiro and the Renovação Fight Team. The Australian Team led by Matthew Hull-Styles set the introduction of Luta Livre to this country in motion in 2013 contacting Nico Welko about his Welko Academy project. Hull-Styles recalls “I was looking for someone to come over and teach us authentic Luta Livre because my students and I wanted an aggressive and unique grappling style so we made contact with Nico Welko who was actually the only one willing to come to Australia to help us”. From that day Welko started sharing Luta Livre techniques with Hull-Styles via exclusive instructional videos based on specific request in order to support the beginning of this Australian Team’s journey. Hull-Styles remembered “From then on I was convinced this was the right path to take because as time passed we realized that we share the same values and principles about what we do and why we do it, so it was definitely worth waiting almost 18 months to reach the point we have today” further he comments “I am extremely proud to be the first Team flying the Welko Academy flag since 2014 in tournaments and now together with my Team to be the first ever officially graduated Luta Livre practitioners in this country and also being affiliated to RFT”. Nico Welko says “I am very happy about the relationship we developed over time and I am also very proud to bring our own RFT Luta Livre Style to his country and I mean literally in order to represent our Luta Livre as an independent discipline with absolutely no ifs or buts” he continued “now we have made history and I am also happy to bring the RFT affiliation to Australia as an extension to what we have started with the Welko Academy project”. Marcio Cromado, Headcoach of RFT comments "I am also very happy for the work that Nico Welko, our representative Black Belt, is doing by expanding our own style even to Australia with the differentiated RFT Luta Livre standards, which we constantly refine and we are able to do so simply because we are the only competitive Luta Livre Team fighting in high level events like UFC, Bellator, ADCC, NAGA etc. There are no other Luta Livre Teams out there with the high level of know-how that we have". In recognition of the great work of Nico Welko in developing the Luta Livre program for USC students, the Student Guild, in conjunction with Hull-Styles presented Welko with an award at the end of his visit. This award was based on the historic and successful transmission of the training program as well as celebrating the beneficial cultural exchange experienced by all parties.